Few things are worse than a chronic toothache, and unfortunately there are a variety of medical conditions that may cause this to occur. However, one of the most common causes of chronic tooth pain comes in the form of an infection in the pulp of your teeth. The pulp of a tooth is the soft tissue beneath the enamel and dentin that is made up of blood vessels, nerves, and connective tissue that were all present to help the tooth grow during development. 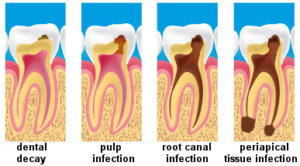 If the pulp becomes infected, your dentist may recommend endodontic therapy, commonly known as a root canal treatment. Despite the painful reputation this procedure has garnered over the years, recent developments in dental technologies have made the treatment relatively painless, easy, and quick. That way, our talented staff at Rockefeller Cosmetic Dentistry can fix your oral pain and get you back to smiling! In essence, a root canal therapy treatment involves opening the tooth to treat infected or inflamed pulp by removing damaged tissue then cleaning, reshaping, filling, and sealing it to prevent further damage and future infections. Endodontic therapy is the treatment of a tooth’s infected or inflamed pulp. Poor oral hygiene often leads to infections. If you don’t brush and floss regularly (twice daily), a buildup of plaque that could lead to cavities may occur. Untreated cavities eventually reach down to the center of your tooth, causing an infection in the sensitive pulp. Broken teeth can often lead to infection if improperly treated. Exposed roots or cracks in the enamel allow bacteria to seep into the pulp and cause infections. 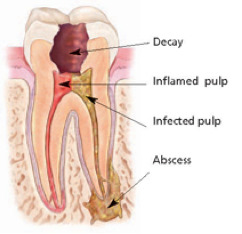 Gum disease may also eventually reach into the pulp and tooth root, causing an abscess. Pain when eating hot, cold, or very sweet foods. Sudden, sharp pain anywhere in the mouth. Infection in the mouth, often appearing as chronic sores near your tooth’s root, in the gums. Thanks to modern advancements in dental technologies, root canal therapy has become a relatively painless and easy procedure. Your first appointment will begin with a thorough cleaning of your teeth, wherein your dentist will pay special attention to the infected tooth. A rubber dam will then be placed around the affected tooth, held in place by a few small clamps to enable better vision for your dentist and more comfort for you while in the chair. A local anesthetic is then applied before your endodontist creates a small opening in the tooth to remove infected pulp. Using a variety of files, your dentist will then scrape and remove damaged pulp before enlarging, shaping, and cleaning the canals inside of your tooth. 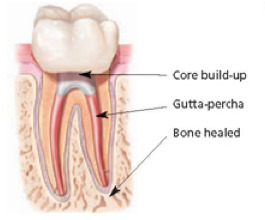 A rubber material (gutta-percha) is then used to fill and seal the canals of your tooth before a permanent filling is affixed over the incision point. It is natural for your affected tooth to retain sensitivity in the first few days after your procedure, therefore it is recommended you avoid hard, solid foods for the first several days. Especially during this time (but also in general) it is important to brush and floss twice and rinse with an antiseptic mouthwash at least once daily to maintain good oral hygiene. Although a full restoration may be necessary depending on the severity of the dental pulp disease, with proper oral hygiene and care, your endodontically treated tooth can last just as long as a natural tooth! If you are experiencing sharp pains in your mouth and teeth, don’t hesitate to call our Midtown dentist office at (212) 851-1091 or request a root canal consult here. Don’t let misplaced fear of pain dissuade you from getting a root canal, it could save your tooth — and your smile! If you are experiencing intense pain that affects your daily life and functionality, you may be in need of an emergency root canal. Click here for more information on our emergency dental services.